As the largest website for discount gift card deals, Gift Card Granny is often featured in the news and other media outlets. Here are some recent video segments. If you are interested in either featuring Gift Card Granny or speaking with Trae Bodge, Gift Card Granny's smart shopping expert, please send a contact email. Gift Card Granny's smart shopping expert shares ways to save on school supplies. Shopping Expert for Gift Card Granny discusses back to school online deals. Gift Card Granny's Smart Shopping Expert, Trae Bodge, talks the future of grocery shopping with The Morning Dose. Trae Bodge talks with Philadelphia's Morning Dose about Instagram's new shopping feature. Trae Bodge, Shopping Expert for Gift Card Granny, gives insight into trends with Amazon's Alexa. Shopping expert, Trae Bodge, gives tips on buying discount winter clothing. Gift Card Granny's smart shopping expert explains how to save with discount gift cards when upgrading your smartphone. Trae Bodge explains how you can make your own sales with Gift Card Granny during Black Friday. Trae Bodge details how to save money through discount digital deals. Shopping expert, Trae Bodge gives Black Friday strategies to save money. Trae Bodge explains why the trends of shopping on Thanksgiving are beginning to reverse. Rachael Ray and Gift Card Granny's Trae Bodge discuss how to make some extra cash with unwanted household items. Trae talks with Arizona Midday about essentials for busy people. Trae Bodge discusses how you can provide Google-like perks for your office while on a budget. Get groceries delivered directly to your doorstep. Trae Bodge discusses the five essential apps for entrepreneurs to save money and find deals. Trae Bodge discusses how to get deals on March best buys with discount gift cards. Granny's Smart Shopping Expert, Trae Bodge, discusses five tips to save on Valentine's Day gifts for your sweetie. Trae discusses budget-friendly tips for the holidays. Trae discusses how to get bonus gift cards with Gift Card Granny's Secret Deals. Get bonus gift cards or other goodies with Granny's Secret Deals. Trae Bodge, Shopping Expert for Gift Card Granny, tells about some amazing apps and sites for discounts. 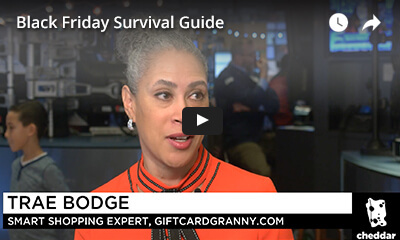 Trae Bodge talks easy-to-use shopping tips including Gift Card Granny. Lynnette Khalfani-Cox gives sweet tips about Black Friday shopping and discount gift cards. Trae Bodge shares tips on how to save with Gift Card Granny. Use Gift Card Granny to sell or trade your unwanted gift card. Turn the gift cards you don't want into cash through Gift Card Granny. Tips on getting cash from your unwanted holiday gift cards on Gift Card Granny. Trade in your unwanted gift card on for cash. 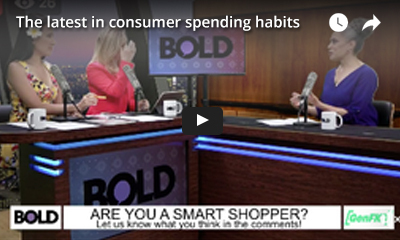 Shopping expert, Trae Bodge, gives tips on how to save money with discount gift cards. WCCO 4 News explains why you should never pay full price when there are so many discount gift card offers! Trae Bodge talks about savings techniques with coupons, gift cards, extensions, and apps. Trae explains Targets response to the rise in online sales. Stay at home and get great Black Friday deals online with Gift Card Granny! 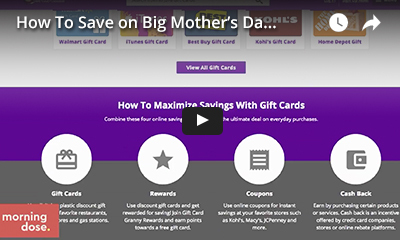 Lifestyle expert, Limor Suss, explains how you can use Gift Card Granny to save tons on your Mother's Day shopping. Get back to school clothing and supplies at discount prices with Gift Card Granny. Alison Morris discusses Trae Bodge's best discount tricks to save tons. Trae Bodge advises how to find great discounts during the graduation season. ABC gives a rundown of the holiday gift card situation. 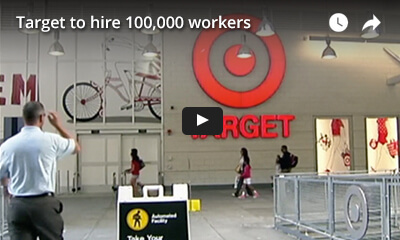 ABC breaks down returning gifts and reselling gift cards. Trae Bodge, Shopping Expert for Gift Card Granny, discusses the trend of stores holding less inventory and making more orders for customers. Finding the best travel deals with secrets including Gift Card Granny.